Happy Monday! Are you ready for the huge snow storm? The world outside our window looks like a snow globe right now! It's all very beautiful and white, as long as we stay inside! Before settling in for a few snow days, Hermione and I did what we do every Monday morning... go to ballet! Hermione and I go to THE CUTEST ballet class at Dance with Ms. Rachel every Monday morning. 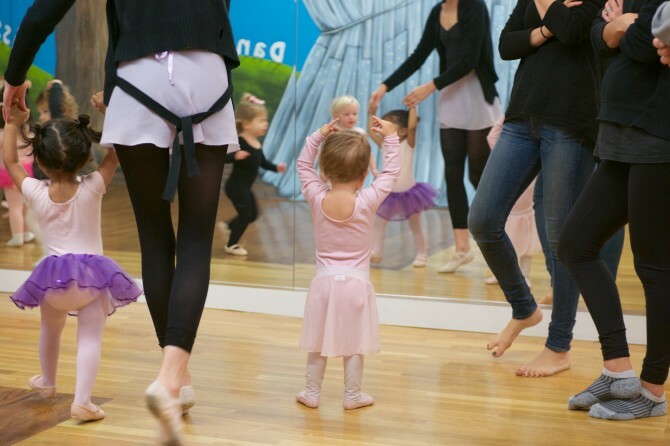 Seriously, what is cuter than a bunch of tiny ballerinas in leotards and tutus? I love everything about Dance with Ms. Rachel from the live piano music (Hermione has a bit of a crush on Mr. David the accompaniest ), to the creative songs and games, to the uber sweet and captivating teachers. Ms. Rachel is a very old friend of mine from back in my performing days and it is extra special to have her be Hermione's first dance teacher. I still remember my first ballet teacher fondly (Ms. Piver!) and hope Hermione remembers her time with Ms. Rachel for years to come! We love Dance with Ms. Rachel so much Hermione will be celebrating her 2nd Birthday there in just a few months. How she is almost 2 I have no idea!